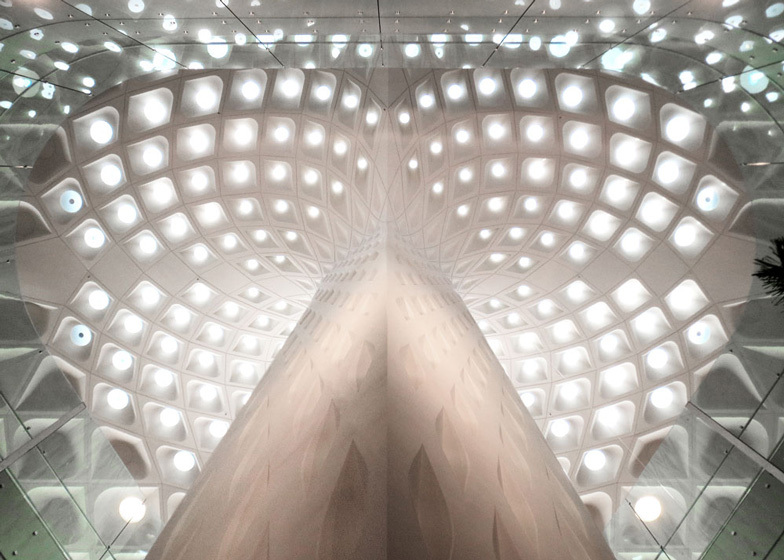 The panelled cells of the canopy spanning this new airport terminal in Mumbai was designed by American firm SOM to reference both the open-air pavilions of traditional Indian architecture and the arrangement of feathers in a peacock's tail (+ slideshow). 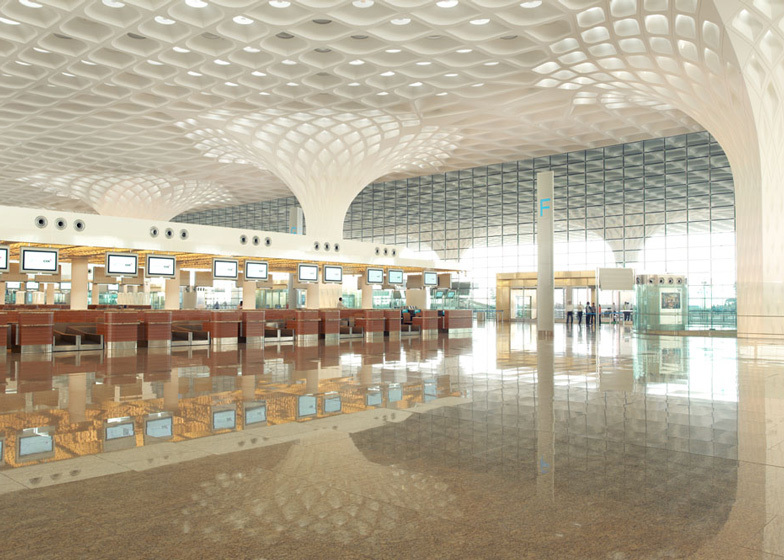 The new 40-hectare terminal at the Chhatrapati Shivaji International Airport will accommodate 40 million passengers a year for both international and domestic flights, and was designed by SOM to adopt the styles and motifs of the regional vernacular. "We designed an airport that is intimately connected to its surroundings," said SOM partner Roger Duffy. 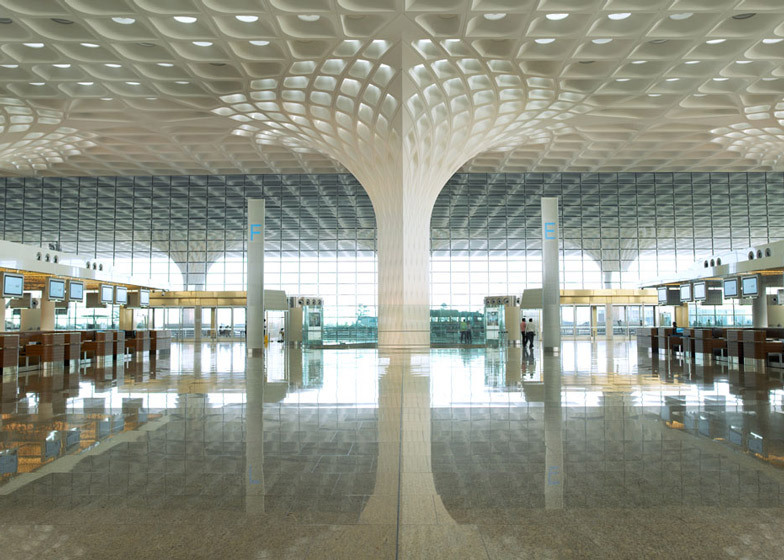 "By subtly incorporating regional patterns and textures at all scales, Terminal 2 resonates with a sense of place and serves as a spectacular symbol for India and Mumbai." The check-in hall is located on the upper level of the four-storey terminal, directly beneath the perforated ceiling, which was created using glass-fibre-reinforced gypsum panels. This canopy is supported by 30 tapered columns that are punctured with similar recesses, creating a decorative pattern of openings that are infilled with coloured glazing to allow light to filter through the space. "The monumental spaces created beneath the 30 mushrooming columns call to mind the airy pavilions and interior courtyards of traditional regional architecture," said the design team. "The constellation of colours makes reference to the peacock, the national bird of India, and the symbol of the airport," they added. A 900-metre long glass wall with a gridded cable frame provides the hall's facade. The decorative canopy extends beyond the walls to offer protection from both intense heat and monsoons, but also creates an area where Indian departure ceremonies can take place. The rest of the terminal is laid out with an X-shaped plan, where modular concourses radiate outwards from the central core to minimise walking distances to boarding gates. Floor-to-ceiling glazing offer passengers the opportunity to watch planes arriving and departing, while patterned jali screens help light to filter gently through the spaces. Photography is by Robert Polidori, apart from where otherwise stated. Ten years ago, Mumbai's Chhatrapati Shivaji International Airport welcomed six million passengers per year through its gates; today it serves nearly five times that number. With the city's emergence as India's financial capital and the country's rapidly expanding and economically mobile middle class, the existing airport infrastructure proved unable to support the growing volume of domestic and global traffic, resulting in frequent delays. 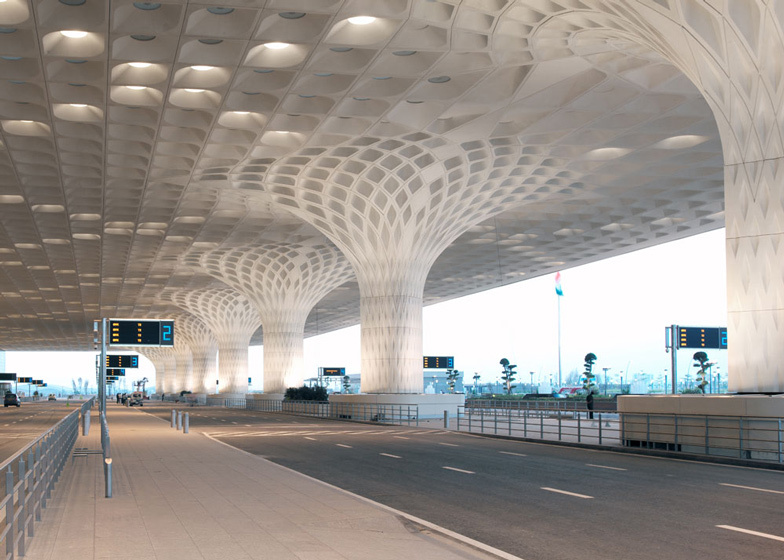 By orchestrating the complex web of passengers and planes into a design that feels intuitive and responds to the region's rocketing growth, the new Terminal 2 asserts the airport's place as a preeminent gateway to India. 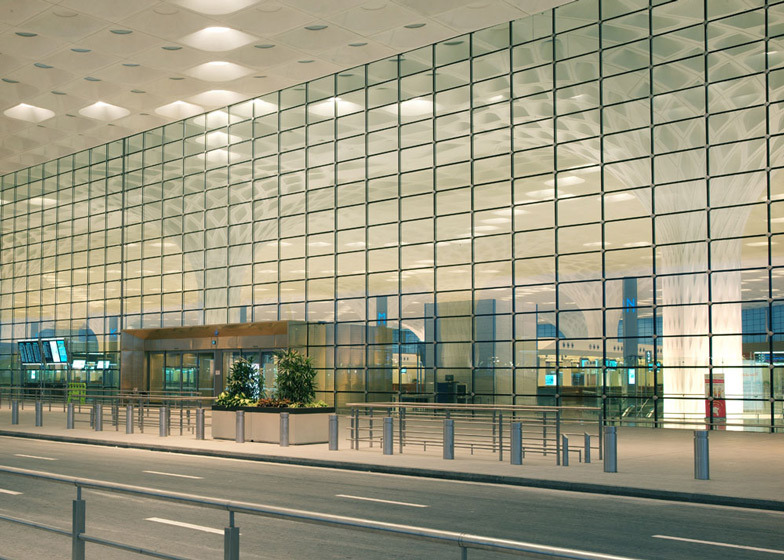 Chhatrapati Shivaji International Airport Terminal 2 adds 4.4 million square feet of new space to accommodate 40 million passengers per year, operating 24 hours a day. The terminal combines international and domestic passenger services under one roof, optimizing terminal operations and reducing passenger walking distances. Inspired by the form of traditional Indian pavilions, the new four-story terminal stacks a grand "headhouse", or central processing podium, on top of highly adaptable and modular concourses below. Rather than compartmentalising terminal functions, all concourses radiate outwards from a central processing core and are therefore easily reconfigured to "swing" between serving domestic flights or international flights. But just as the terminal celebrates a new global, high-tech identity for Mumbai, the structure is imbued with responses to the local setting, history, and culture. Gracious curbside drop-off zones designed for large parties of accompanying well-wishers accommodate traditional Indian arrival and departure ceremonies. Regional patterns and textures are subtly integrated into the terminal's architecture at all scales. From the articulated coffered treatment on the headhouse columns and roof surfaces to the intricate jali window screens that filter dappled light into the concourses, Terminal 2 demonstrates the potential for a modern airport to view tradition anew. All international and domestic passengers enter the terminal headhouse on the fourth floor, accessed from a sweeping elevated road. At the entrance, the lanes split, making room for wide drop-off curbs with ample space for traditional Indian departure ceremonies. From the moment of arrival, the terminal embraces travellers. Above, the headhouse roof extends to cover the entire arrivals roadway, protecting passengers and their guests from Mumbai's heat and unpredictable monsoon weather. 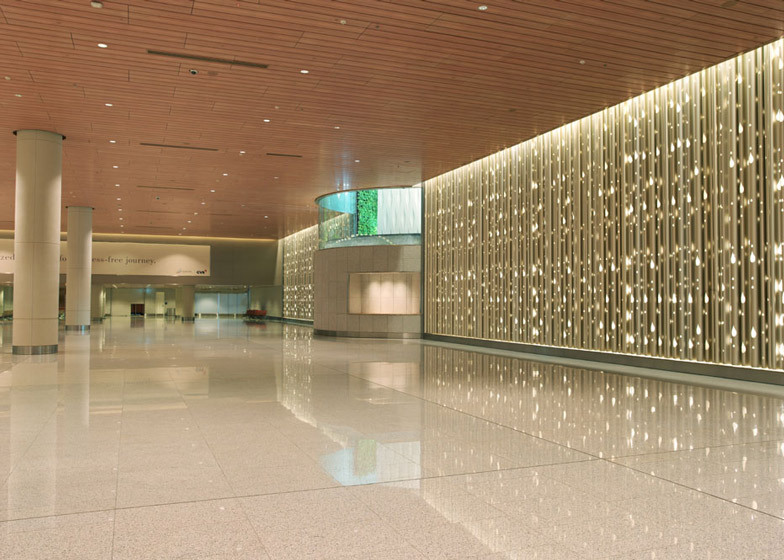 A 50-foot-tall glass cable-stayed wall - the longest in the world - opens to the soaring space of the check-in hall. The transparent facade also allows accompanying well-wishers, who must remain outside of the terminal due to Indian aviation regulations, to watch as their friends and family depart. Once inside, travellers enter a warm, light-filled chamber, sheltered underneath a long-span roof supported by an array of multi-storey columns. The monumental spaces created beneath the thirty mushrooming columns call to mind the airy pavilions and interior courtyards of traditional regional architecture. Small disks of colourful glass recessed within the canopy's coffers speckle the hall below with light. The constellation of colours makes reference to the peacock, the national bird of India, and the symbol of the airport. The check-in hall leads to a retail hub - a common space that allows passengers to shop, eat, and watch planes take off though expansive, floor-to-ceiling windows. Centrally located at the junction of the concourses and the terminal core, these commercial plazas provide a focal point of activity in close proximity to the gates. 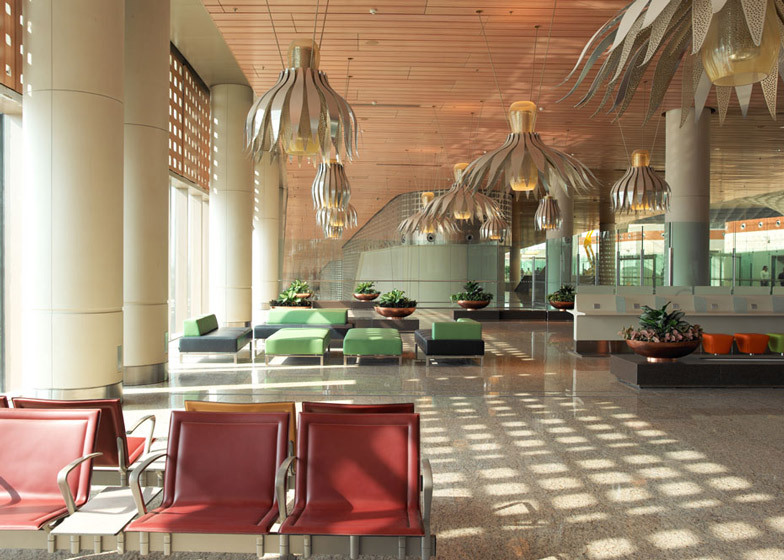 Within these spaces and throughout the concourses, culturally referential fixtures and details, such as custom chandeliers inspired by the lotus flower and traditional mirror mosaic work created by local artists, ground the traveler to a community and culture beyond the airport. Regional artwork and artifacts are displayed on a central, multi-storey Art Wall, illuminated by skylights above. The prevalence of local art and culture, coupled with the use of warm colours and elegant accents, elevates the ambience of terminal beyond the typical, often unimaginative airport experience. Although the terminal is four storeys, interconnecting light slots and multi-storey light wells ensure that light penetrates into the lower floors of the building, acting as a constant reminder of the surrounding city and landscape. At dusk, illuminated from within, the terminal glows like a sculpted chandelier. The construction site of the new terminal building was located in close proximity to the existing terminal which had to remain fully operational during construction. This site requirement inspired the elongated X-shaped plan of the terminal, which could both mould around existing structures and incorporate modular designs to accommodate rapid and phased construction. This innovative form also allows for the consolidation of important passenger processing, baggage handling, and retail/dining functions at the centre of the terminal. On each floor, radiating piers permit the shortest possible walking distances from the centre of the terminal to boarding areas, while also maximising the terminal's perimeter for aircraft gates. The terminal's roof - one of the largest in the world without an expansion joint - ensures further terminal flexibility. The long-span capabilities of the steel truss structure allow for the spacing of the thirty 130-foot columns to be far enough apart to not only give a feeling of openness to the large processing areas below but also to allow for maximum flexibility in the arrangement of ticket counters and other necessary processing facilities. Terminal 2 uses a high-performance glazing system with a custom frit pattern to achieve optimal thermal performance and mitigate glare. Perforated metal panels on the terminal's curtain wall filter the low western and eastern sun angles, creating a comfortable day-lit space for waiting passengers, and responsive daylight controls balance outdoor and indoor light levels for optimal energy savings. Strategically-placed skylights throughout the check-in hall will reduce the terminal's energy usage by 23%. At Terminal 2, modern materials and technologies are used to powerful effect. 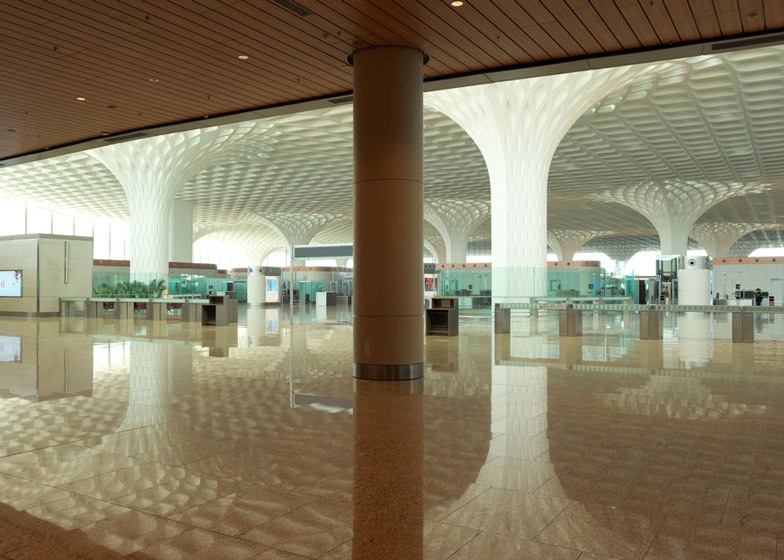 But while cutting-edge strategies set a new standard for sustainable, modern airport design, the terminal is as much a showpiece of the history and traditions of India and Mumbai as it is an unprecedented structural and technological achievement. Rising from the Mumbai cityscape, Chhatrapati Shivaji International Airport celebrates both India's rich cultural heritage and the country's increasingly global future.